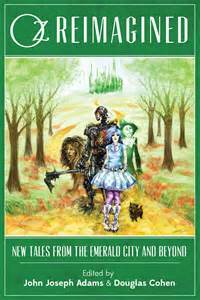 Edited by John Joseph Adams and Douglas Cohen, Oz Reimagined: New Tales From The Emerald City and Beyond is a collection of short stories with a fabulous variety of alternative tellings of The Wonderful Wizard of Oz. There’s something comforting about revisiting a classic like Oz and twisting it around to see what new things we might learn about the characters we love. And then, if we don’t like a particular alternative version of Oz as presented here, we can discard it and we haven’t invested a huge amount of time. But when we do feel moved by another version, it reveals the richness of the original. We begin with “The Great Zeppelin Heist of Oz,” which presents the Wizard as a pig-headed huckster who can’t stand the idea of women (the four witches) being in charge of the kingdom (or should it be queendom?) It’s funny and smart and the witches don’t take any guff from this blowhard, which is very satisfying. On to Dorothy Noir in “Emeralds to Emeralds, Dust to Dust,” which contains the description of “a sky the sunny f**k-you color of a Munchkin swaddling cloth.” Enough said. “The Lost Girls of Oz,” by Theodora Goss, one of my favorites, is presented in letter form. Eleanor Dale, intrepid girl reporter, is investigating the strange disappearance of young girls in town, and, it turns out, across the country. She meets Oz, who now goes by Oscar and is trying to make up for deceiving the people of Oz by helping Ozma—granting refuge to girls who need it (many, it seems, are abused and beaten and otherwise taken advantage of) by sending them to live in Oz. There turns out to be an army of girls, and it’s a grand vision of Girl Power. Tad Williams contributed “The Boy Detective of Oz: An Otherland Story.” It’s about Oz as a simulated world, and there’s a boy who’s somehow entered that reality and participates in its stories. I didn’t care for this one, but others more into cyber stuff probably would. There are two stories about Dororthy being old, “Dorothy Dreams,” about her being in a nursing home, and “A Meeting In Oz,” about Dorothy going back to Oz in her old age to see how Oz has fared. Both are rather terrifying, but fascinating nonetheless. Jane Yolen’s “Stolen Away,” is very creepy. A bystander from the town where Dorothy lived tells the real story, that there were two tornadoes, to start with, and the first one took Toto and killed him. “A murder of me,” she liked to say. She made it into a song to sing when she was bored, and sometimes, when things got dark inside her head, she screamed it, flapping her arms and jumping on tables, screaming and screaming those same four words until the monkeys with the needles came to drag her away. Crow believes in the power of names, and hits upon a nickname for Tina, the narrator, that fits perfectly: Tin-Girl. Tina, who is a cutter, likes it because, “wouldn’t that be a great deal, hard on the outside, hollow on the inside, too hard for the knife, too empty to need it.” I was emotionally invested in each of these characters, and this story will stay with me a long time. Ken Liu was unique in “The Veiled Shanghai,” putting a lost Dorothy into real historical political events—an anti-imperialist uprising that started with student demonstrations at the turn of the 19th century in China called The May Fourth Movement. John Joseph Adams is an excellent editor of collections like this, of which he’s done many. I’ve read some really bad anthologies that take a fun idea and make it so campy it’s just fluff with no interesting ideas. Not so with Adams, who is consistent in the quality of his collections. Oz Reimagined includes stories by respected writers of fantasy like Jane Yolen and Orson Scott Card, plus not so well-known writers who are doing excellent work and deserve more attention. Even if you are a strict fan of the original Oz, you may still enjoy these stories, as they ignore the MGM movie version with its red shoes and cowardly dream-sequence ending and stick to Baum’s original idea as a starting point. I enjoyed this collection so much that I’ve gone back to reread the original, with an intention to read some of the sequels that I never got to as a kid.